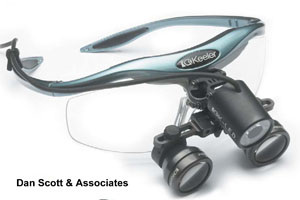 Keeler Loupe LED Light Source - Dan Scott and Associates, Inc. The 3W L.E.D. is mounted coaxially on the loupe bar and is powered by a lithium battery pack giving 4 hours continuous use. The K-L.E.D. comes with two battery packs and a charging unit that can hold and charge both packs simultaneously, as well as being a convenient container to keep loupes when not in use. The K-L.E.D. can be retrofitted to all Keeler loupes.